Constructing Walking Jazz Bass Lines Book I -The Blues in 12 Keys is a complete guide demonstrating the devices used to construct walking jazz bass lines in the jazz tradition. 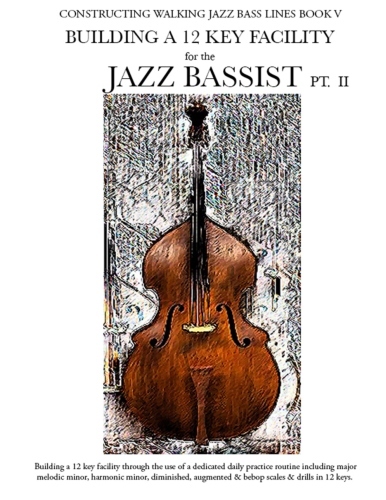 Included is over 150 choruses of walking jazz bass lines over the Jazz Blues lines in 12 keys. Part I. Includes triads, 7th chords, voice leading, playing over the bar line, chord substitutions, pedal points, harmonic anticipation and chromatic approach notes. All exercises are designed to give the Bassist strong jazz walking bass lines in the bottom register of the instrument. As an added bonus for the Double Bassist Part 1 provides a complete study of the Blues in F whilst in the first and open positions. This is an excellent technique builder.